Out of billions of people, a handful possess superpowers. Sixteen-year old Mathilda Brandt just discovered hers: the ability to listen to and control plant life. For now, her being Empowered is a secret, but she will face a stark choice when the world learns about her new ability: either put on the blue jumpsuit and become a member of the Hero Council and follow any and all orders, or forswear ever using her power for any reason. Mat refuses both choices, and instead goes underground, having found a hidden place where she can belong with others like herself. But if she wants a place to belong, first she must save it. Renegade is the prequel to the Empowered series. This was a fun introduction into the Empowered series. I decided to read this one before I started on book 1 and I am glad I did as the events in this book feel like they will be an important part of Mathilda’s story. It’s a decent length and doesn’t feel too rushed, although some things do happen a bit quickly. I liked how we got introduced to Mathilda in this book and got a bit of a feel for this world, the powers and even a tad of politics. There are still things that aren’t entirely clear, but I figure that will be clarified in book 1. 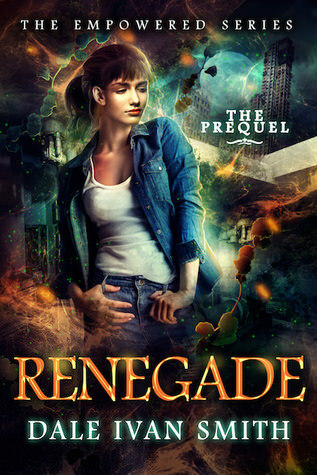 This book mostly focused on when Mat grows into her powers and gets discovered by a group that calls themselves Renegade’s. If you have read the blurb of book 1 you know how this novella will likely read. And while situations like that can lead to very bittersweet novella’s that wasn’t the case here. Even knowing what was going to happen, I didn’t fully feel the tension or suspense. I guess that’s my main complaint about this novella that I never felt fully engaged in it and didn’t feel the emotions. That’s okay though as I still really enjoyed this novella and how it was a nice piece of background information about Mat. I also would’ve liked to get to know Mathilda a bit better, but I am sure that will happen in book 1. I do like the writing of this author so far. The writing flows nicely and the pace is well done, with enough details to get a feel for things, but not too much to bog things down. Some things do happen a bit quickly, but I think that’s more due to this being a novella than the writing. I did think some of the dialogue felt a tad off at first, but that improved as the story progressed. The concept of this series is what got my attention in the first place and the beautiful covers. I don’t read many superhero stories, but this one just sounded so fun and I like that Mathilda’s power involves plants. Which is also one of my favorite parts of this one. I liked reading about her powers and there were quite some scenes she had to use them, so we got a bit of a feel for what she could do and how it worked. I liked the descriptions of her powers and how she felt the plants. To summarize: This novella was a fun read and makes me curious about the rest of the series. It was a fun read that gives the reader a feel for Mathilda and this world. I think the events here will be an important part of Mathilda’s story. The writing was well done and I liked reading about Mathilda’s powers. I did think there could’ve been a bit more emotion as I didn’t really feel the tension or suspense. And at the start there was some dialogue that seemed a bit off, but that improved when the story progressed. All in all this novella gave a nice piece of background information and made me looking forward to start book 1. Do you like stories about superheroes? Sounds like it wasn’t perfect, but still did a great job of introducing you to the author’s writing style, the world and the characters within the limited pages and left you wanting to go on with the rest of the series. I like the superhero elements and the secret group you describe. I have by now finished book 1 as well, which also wasn’t perfect, but still a fun read. This one worked well as a prequel with how it introduced the world and characters. The superhero elements are my favorite part of this series so far. Sounds like a good prequel. Thank’s for sharing! To be able to listen and control plant life. Now that would be an interesting super power. Yes it really sounds like a interesting super power and I like how the author describes her power. Thank you for a great review, Lola. I like the idea of this particular superpower – wish I had it now that we are starting to get the garden going again! It certainly would be a great power for gardening! It sounds really neat how it was described in the book. That’s good you got a feel for things and enjoyed it even if you didn’t feel the tension. Controlling plant life sounds pretty cool. A character in my fave series can kinda do that, but he can’t actually listen to the plants, and he’s a faerie, not a superhero. It was a good prequel novella and I really liked her superpower. It was described well. I finished book 1 by now too, the superpowers were one of my favorite parts of book 1 as well.